Since the year is coming to an end, it’s the right time now to look back at our course “Be Visual! Sketching Basics for IT Business” that successfully ran twice in 2017 on openSAP. 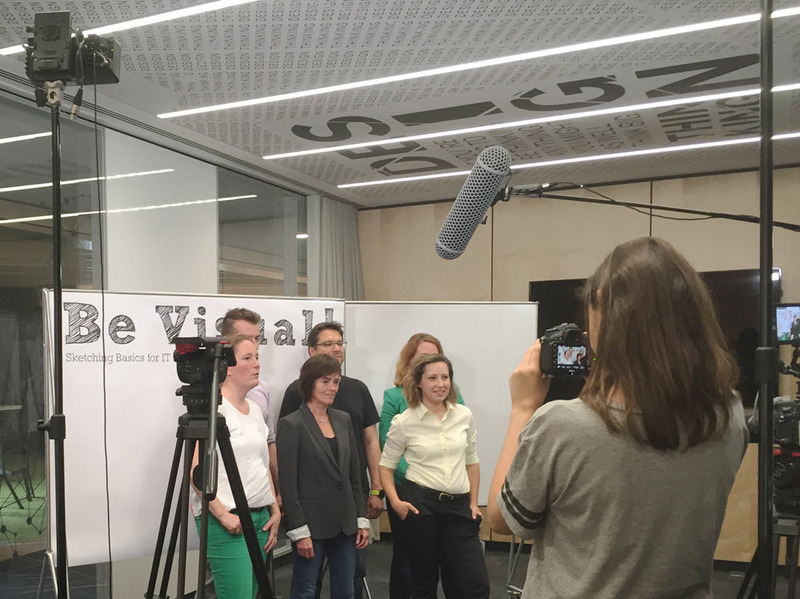 We invited Johanna Wittig, Senior User Experience Designer at SAP and one of the course instructors to give us a glimpse into the idea and the production and delivery of the course. We will also share facts, figures and feedback with you. openSAP: Why did you create a sketching course for IT developers? Johanna Wittig: ‘Bring sketching to the developers’ – that was the initial ask where the whole story started. Our manager realized, that agile development approaches require effective exchange between the involved people. Visual communication is known to easily explain a common understanding between discipline. Having this in mind, we started engaging with developers on their collaboration habits when discussing solutions within the team. And what did we find? They use the whiteboard a lot during their discussions, but skills could be improved here, such as the handwriting. That’s why we designed onsite sketching classes focusing on sketching basics for daily use. openSAP: What did you want to achieve with the course? Johanna Wittig: Our main goal was to increase developers’ confidence of communicating in a visual way. We especially emphasized that it does not take an artist to visualize ideas. During the first onsite classes, we realized that the content was not only relevant for developers, but for many other roles such as product owners, managers, or scrum masters. Therefore, we started to look for ways to reach a much broader audience, and a MOOC seemed to be the right channel. openSAP: What challenges did you face when bringing this course to an online and global audience? Johanna Wittig: First, we had to adapt the course content to meet the online requirements, think of a set of materials, and script our sessions. We had more or less no experience with video recordings. For early prototyping, we used video conference tools to validate if the format of sketching along works, which turned out to be promising. The video team really did a great job in setting the scene for us and our special needs. Overall, we learned a lot throughout the production and are proud of the result. Let´s have a look at the course content. Practice is an essential part of the course. In week one, we speak about visual communication basics and tips and tricks for writing. We show you some tips and tricks for sketching in a larger format (flipchart/whiteboard) and walk you through the visual alphabet. Here, the focus is on improving your own handwriting by applying easy tips. The week two topics cover processes, flow charts, and screen sketches. We guide you through a set of important shapes and then practice the combination of text and containers. To introduce the topic of screen sketches we start with some theory, but move to practicing wireframes and teaching you some useful techniques for producing low-fidelity prototypes that can be tested with users. The first topic of week three, we cover the use of materials in different sketching scenarios. We talk about pens, markers and their use in given situations; post-its, A4/letter-size paper, and larger formats such as flipcharts and whiteboards. After that we walk you through a collection of objects that can be used for enriching post-its, storyboards, and flipcharts. Here you can practice objects from the area of workspaces, interiors, and buildings, transportation, symbols, and text frames. The final weeks’ lessons prepare you perfectly for storyboarding. It starts with people and movement, and ends with the topic of visual storytelling. We show you how to sketch people with emotions. The focus then shifts to body language, and how to sketch people in different positions. The second topic of the week covers storytelling. Here, we provide a brief overview of the history of storytelling and how stories are designed nowadays. Then we introduce tips and tricks from filmmaking and comics that can be used to create an appealing storyboard. You can learn about reference objects, movement in time and space, and camera distance and perspectives. The use of panels, which structure comics, will also be introduced. Even by openSAP standards, this course was unusual, because the exercises were done on paper and then submitted as photos or scans. Participants said that this course really enriches the openSAP portfolio. 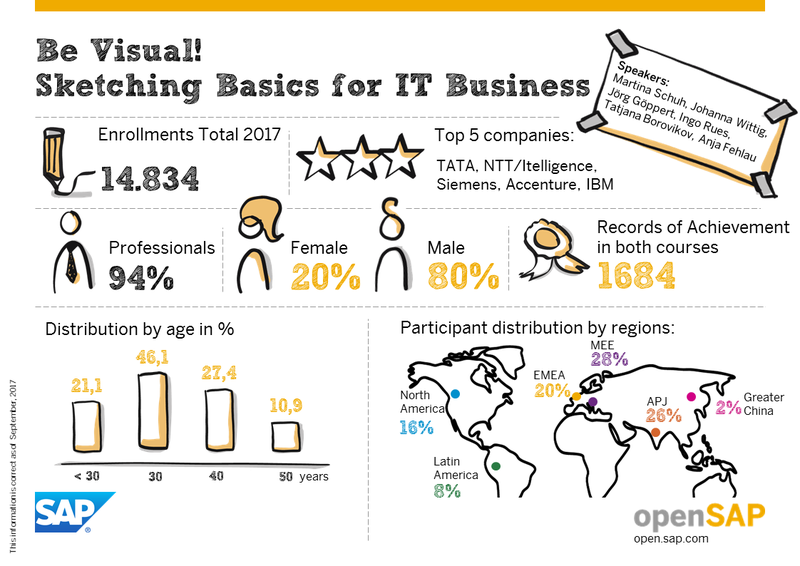 This openSAP course ran twice in 2017 with a total of 14,834 course participants. Please have a look at this graphic to get some more details on the statistics and key metrics. We are very happy to see that the courses were very well perceived by the participants. We are happy to announce that the course will run again from February 6, 2018 and enrollment is now open.